Four years. That is how long it should have taken. But nine years after starting at Sudan Interior Church (SIC) School, the first students have finally graduated from their secondary school education. The story of SIC School and its students is quite extraordinary and a testimony to the patient endurance of its leaders, teachers and students. SIM South Sudan's church partner is Sudan Interior Church and in 2004 the SIC leaders came to SIM with a heavy heart for their youth who had no chance of an education. God’s people gave through SIM, and in 2007 a secondary school building was completed in Yabus, Blue Nile State of Sudan. Thirty-four students enrolled in the school, most of whom took up boarding and enjoyed a wonderful time, studying well. However, three years later in 2010, Yabus found itself in a war zone where bombs fell regularly and continue to fall to this very day. Some of the teacher housing has been totally destroyed. Remaining at the school became too dangerous and the school closed its doors that year - the start of a three year gap in schooling for the students. A three year wait. This wasn’t a snow day. Nor was it a teacher strike. The Yabus campus was abruptly closed (and remains closed) because of war. This was not the only lengthy wait the students had to endure. Teachers, leaders and students didn’t give up. 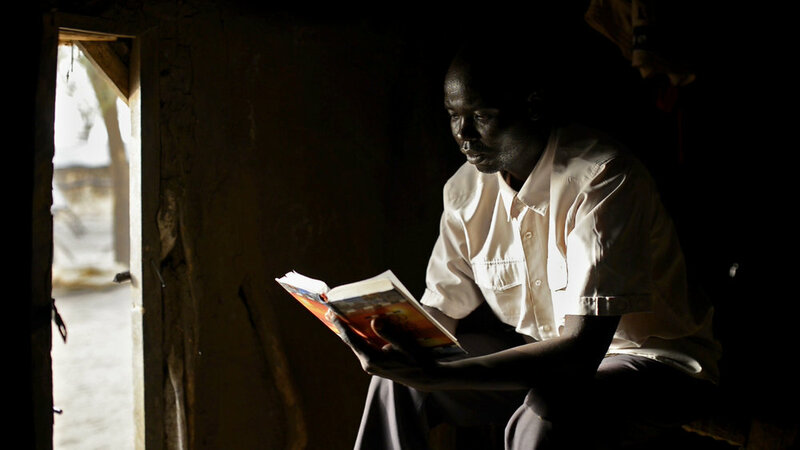 SIM, together with the students and SIC church leaders, made a decision to build another school, 30 km away in Doro, in Maban County, South Sudan. Dikem is one of those 34 students and I had the pleasure of meeting him while in Doro and hearing his story. Dikem: “I am from Blue Nile and a tribe called Uduk. I am living with my wife, son and three daughters in Doro, Maban County and we are all well. We are refugees and this is my second time as a refugee. We face many different challenges. We have been given food by the UNHCR but it’s not enough and we run out of food most months. I’m living under a simple shelter that we built. UNHCR supplied us the plastic bags for protection from the rain. Tim: How did you come to be at SIC secondary school? Dikem: The call of God came to me while I was in Blue Nile in 2008 and our church elders appointed me to attend SIC Secondary School. It was a wonderful time and the students studied so well. We spent three years at school but then war forced us to leave. We shifted to Maban County. The students assigned some of us to bring the property of the school on foot from Blue Nile to Doro. God protected us as we did this. Tim: Three years is a long time to wait. How was the time for you while the SIC school was closed? Dikem: It was not good for me while the school was closed for those three years. In this time, myself and the other students came to Doro and helped the construction of the new school. It was not good for us to be without schooling during this time, but we accepted it because of the situation. Today I am standing in the new school. I observe as more than 60 new students are in class. Bombs continue to fall by the former school grounds across the border in Yabus, but the building still waits for stability in Sudan and for learning to take place within its walls again. Once a sleepy village, where the SIC Secondary School stands today in Doro is now home to more than 150,000 people. The majority of these people are refugees from the neighbouring counties and live in UN camps. With the region relatively stable, 13 of the original 34 students - who are now refugees - were able to complete their education in Doro. They finished at the start of 2016, nine years after they started. It’s a marathon that the students and SIM have run together. A month after the first graduation, the second ever student enrolment took place in February 2016. Ethnically and religiously, the student body represents the whole community: Maban people and refugees from Blue Nile State, Christians, Muslims and ATR (African Traditional Religion) adherents. Dikem recently graduated and is now a teacher of physics at the school helping the new student intake. Tim: What did God teach you during those waiting years? Dikem: Patience in the circumstances. In the situation of war, God is with us and He can protect us. He can provide things in the right time. God called us here to SIC Secondary School with a purpose to help our people. Now there are many new students here. In the years of waiting to complete his education, graduate Dikem has learnt patience in the circumstances and that God protects and is with him. Tim: What are the sacrifices you have made to graduate from secondary school? Dikem: We came to school during the rainy season, barefoot and without bags to carry our books. We carried exercise books by hand. On our way to school, some days the rain was so hard that it stopped us and even wetted our books. At times we could not arrive at the school on time. Tim: You have graduated from the school, what’s next? Dikem: God helped me and I have completed Form 4. God has called me again to come and be a teacher in physics at the school. Whatever God wants me to do, I can fulfil that. I dream of becoming an agriculturalist. I am encouraged to teach my people, telling them about God’s word. Now I am an elder at the church and teaching at Sunday school. Dikem now teaches Physics at SIC Secondary School. War and conflicts have ebbed and flowed throughout Sudan for more than 30 years. Dikem is one of many whose life stories are ones of stopping and starting and relying on God for the endurance to keep going. By the grace of God, SIC Secondary School still operates today and there are more students than ever. The hardships of war and relocation couldn’t keep its door closed forever. Dikem’s determination to complete his education and help his people through the skills he gains is evident through his story and in watching him teach the new students, many of whom are leaders within their own communities in the camps. The new students may not have chosen to be refugees in Doro, but being here means their time in the classroom has finally come. I see a similar determination in their faces and the education they receive here will in turn impact their communities. If you pray, pray for continued peace in the region of Doro. Pray for the students that have graduated in their next steps of work. Pray for the new student intake, that they would be able to complete their education. If you would like to support the school, you can do so via this link.